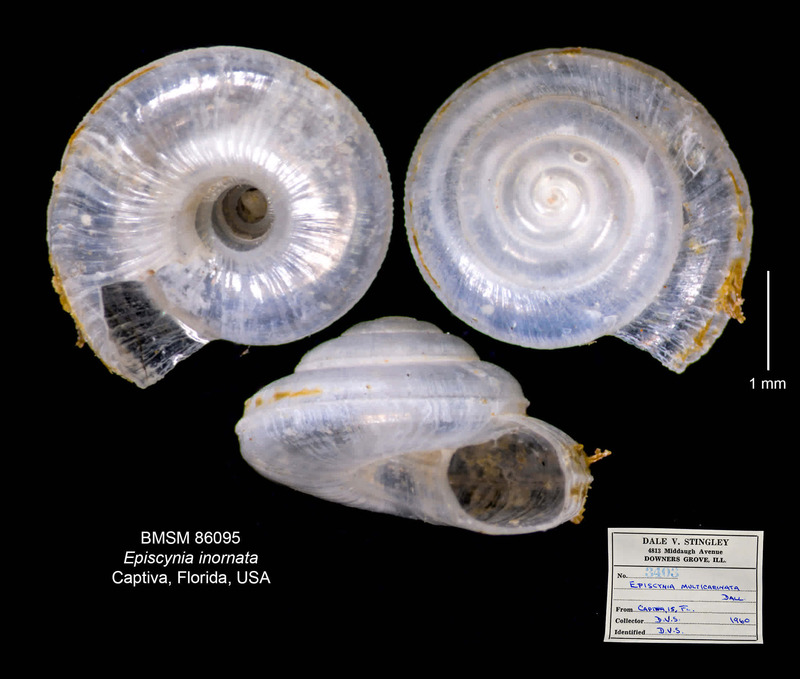 At about 3.5 mm (0.14 inch) in diameter, Episcynia inornata (d’Orbigny, 1842) is one of the “medium-sized” members of the microgastropod family Tornidae (some species of the family measure about 1 mm in diameter only!) Its shell has a flattened trochoid (“top shell-like”) shape, is translucent, probably transparent in the living snail, very thin and fragile, with about 5 whorls. Typically, the shell periphery is garnished with tiny teeth-like projections, with thin wisps of brownish periostracum (the “fringes”) projecting from parts of the shell. The umbilicus is open, lacking a callus. Photos by James F. Kelly.